I love rhubarb, baked in little custards, in crumble or as a compote for breakfast with granola and greek yoghurt. Your recipes look lovely – I have some homemade rhubarb icecream in freezer at moment funnily enough, but must try your cake. The rhubarb compote with greek yoghurt & granola sounds like my kind of breakfast! Mmmm…..! Your rhubarb ice cream looks delicious – but then just roasting it with honey sounds like a really good idea. Not so sure about eating it raw though – even dipped in sugar! I love anything sour so things like rhubarb and gooseberries etc are all scoffed raw as well as cooked. I’ve found quite a few recipes that mix strawberries with rhubarb so I may try that next. I LOVE rhubarb! Your ice cream looks amazing and will definitely try the cake. Although I am sad to say it will be with bought rhubarb. We do have some in the garden but it is very weak, weedy and feeble which is very poor form with us living in Yorkshire. Am wondering if we need to dig it out and start with a new crown?? Weak rhubarb in Yorkshire?? No!! Chat a neighbour up and they may share a crown with you – it does the plant good to divide it occasionally so you’d be doing them a favour, ha ha! I am so in love with rhubarb. I’m thrilled with your recipe for rhubarb cake. In my opinion, topping with rhubarb ice cream is the only way to go. My idea of calorie counting is to skip the main course entirely and go straight to dessert. I like your style Susan. Rhubarb is gooooorgeous! Try making flapjack but put a teaspoon of ground ginger in with the mixture, then sandwich a layer of stewed rhubarb in the middle. Firm family favourite. Funny you should say that – I was sorely tempted to put ginger in the Rhubarb cake but decided to be good for once and just follow the recipe! The rhubarb flapjack sounds amazing and I’ll try this one, thanks! Rhubarb relish sounds good… I now have a hankering for a cheese and rhubarb relish sandwich! I’m going to try a rhubarb smoothie next……. I love rhubarb. The ice cream sounds wonderful – I love the idea of roasting it with honey. I’m going to have to look back through your posts to see where you explain how to force it..
I’m not sure that I have explained how to force it as it’s such a common practice over here (and I’m a lazy blogger!). As the first signs of life show at the end of Winter just exclude the light (an old bucket will do the trick) and the stems will be forced upwards and shoot out sweeter stems. I’ve never heard of doing that before – I might have to give it a try next year (I did look back thru your posts, but didnt find it – so thanks for explaining). I love rhubarb too, although I don’t grow it now and the ones you buy in the shop don’t taste anywhere near what I used to grow. Your ice cream sounds yummy! The forced rhubarb looks so delicate, never tasted them, does it taste sweeter? I think the stems are sweeter, more rhubarb-y and much prettier. Rhubarb is so expensive to buy in the shops too! I probably should have saved this post for reading *after* my attempt to lose 10 pounds. Oh my what sweet goodness. Love your photos, PJ. I feel like I could be sitting down at your table. Your diet needs to be put on hold if Boomdee’s over to see you – cakes and cocktails are surely a must Alys! So much goodness in this post! I’m going to put a rhubarb “forcer” on my list of wants. Great to hear that it worked! I love how yours looks in the garden, too. And two fabulous recipes to try! My husband is the real rhubarb enthusiast, but with these recipes I think we might get some more converts in the house! My rhubarb forcer has started to crack from frost damage so I’m sure I’ll be asking Father Christmas for another one (he reads this blog apparently!). I’ve never eaten it raw before! But I do love rhubarb, and your ice cream recipe sounds delicious! Go on Cathy – give raw rhubarb a nibble… I dare you! Just think of it as sour celery! LOL!!! Rhubarb seems to bring back childhood memories for a lot of people – me included. My Gran used to make rhubarb and date pie. Yum. I also remember eating it raw dipped into a newspaper cone of sugar. The ice cream looks deelish. I have to make sure I don’t strip my poor plants bare… the forced rhubarb is sweeter but still needs sugar unless you’re a hardened sour freak like me! Amazing! The forced rhubarb looks better too! How do you force it? My plants are small still. But I love making rhubarb sauce for cereal. Your recipes look fantastic. I want to try the icecream!! I hope I get a decent harvest! I have a rhubarb forcer which is a terracotta pot – but anything that excludes the light will work (old bucket or bin for example). When the first rhubarb starts to poke through then cover it well to stop the light and the stems will shoot up quicker and taste more delicate. Ohhh, Ok,. I can handle that! Funny enough our cats love playing under the rhubarb – they don’t stay lost for long though! Not a dumb question Dana – slow roasting means using a lower oven temp than traditional roasting. Place the rhubarb on a non-stick sheet, drizzle with honey and cook at around 140c to 160c (200F to 325F). The lower oven temperature ensures the rhubarb doesn’t burn and it helps to caramelise it nicely! I do this with root vegetables too occasionally…. mmmm. 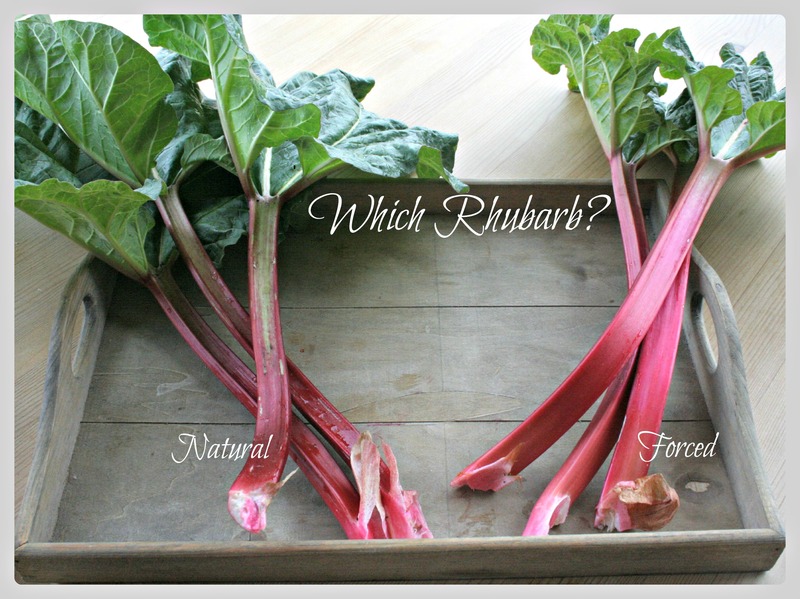 I looooooveeee rhubarb but my plants do not produce much although I only have a few plants….I need to add more and then in a coupe of years I will have loads to try these recipes. I think rhubarb is definitely a love/hate story for most people. Even if I didn’t love to eat it I’d grow it for it’s big leaves that shelter the cats from the rain! 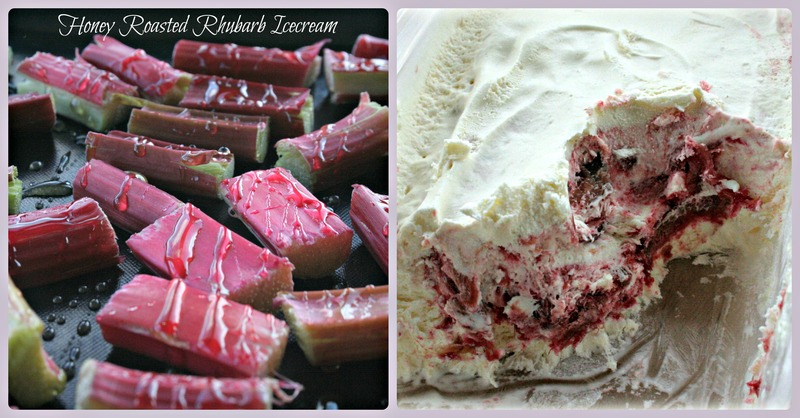 Oh the Rhubarb ice cream is definitely a keeper of a recipe! It is fantastic, with that perfect tangy aspect from the rhubarb! What a great new way to use rhubarb. Thank you! I need no convincing about the merits of rhubarb and I am going to try to rhubarb cake. I saw the buttermilk… did you use gluten-free flour? If not, it looks like it would make a good gluten-free cake. My rhubarb forcer is taking a rest this year since our rhubarb isn’t quite old enough to be forced. I can’t wait to put it back in action next year! The flour isn’t gluten free but it seems a very forgiving recipe. One of my rhubarb plants has started to flower so I’m going out this morning to stop it as I want more of those delicious stalks before they get too stringy. Thanks for these recipes – I made the ice cream on Sunday, so easy and really tasty. I think the next time I make it I’ll mix up the rhubarb before I add it to the cream to make it stir in and look more rippled. Yum. I can honestly say I have never seen, much less tasted rhubarb 😦 It must not grow in my hot, humid climate. What does it taste like? Sweet but yet a root vegetable?? In the UK it’s classed as a vegetable but it’s commonly used as a fruit! It is like nothing else I’ve ever tasted – slightly sweet, very sour and a perfect friend for crumbles and pies. It grows extremely well here so obviously likes damp, cool weather! My rhubarb is just coming in now and so I will keep your recipe ideas in mind. The pictures look delicious! I am curious as to how you forced the rhubarb. I see from a previous post you covered one of the two plants in some fashion. I would like to give this a try. 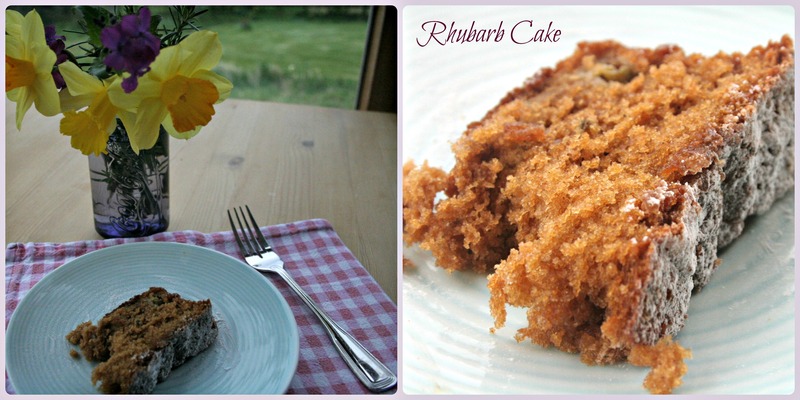 I love rhubarb and your recipes look delicious! I have some friends who use rhubarb in curries but I have yet to try that.